The Golden Tee World Rankings Had a Month to Remember! One would think that the competition surrounding the Golden Tee World Rankings might lessen a bit with each passing month. If March is any indication, however, this is far from the case. The race for the top spot was blistering, but in the end it was a familiar name that made a late surge to reclaim his position at the top of the leaderboard. Houston’s Mark Stenmark was looking up through much of the month, as Minnesota’s Marc “The Mouth” Muklewicz ripped off a handful of -30s to jump out on the rest of the country. Stenmark closed the gap, however, and his magnificent -30 on Dusty Bend helped seal the deal on another World Rankings win. He finished with a 5-score average of -29.4, which is absolutely absurd; as his 411,000 Great Shot Points on the five 2012 courses. Marc Muklewicz was no slouch himself. In fact, he was far from it. He closed out the month with an average of -29.2 which bested third place by nearly a full stroke. The rest of the top five was as follows: Wichita’s Danny “Dannyboy” Beall (-28.4), Ohio native Andy Haas (-28.2), and Minnesota’s Chris Thorbrogger (-28.2). The month of April has brought about a surge of good scores already, but it’s not just about the blazing scores. 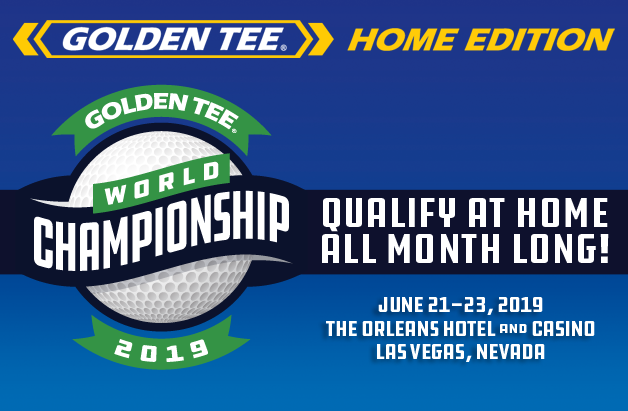 The Golden Tee World Rankings are a great way to track your progress, match yourself with your buddies and see how you stack up against the rest of the GT world. If you haven’t gotten your ranking yet, here’s how easy it is to do so. Play each 2012 course once (five games total) and you’ll get a leaderboard ranking. Your best game on each course will be averaged to give you an overall score. This means your ranking will improve throughout the month if you beat your monthly course best. At the end of the month we’ll reset the rankings and you’ll have a chance to beat your previous month’s score. The green and red arrows on the GT World Rankings Leaderboard showcase how your positioning has changed relative to the previous month. To find yourself on the online leaderboard, simply type in your Persona ID, aka the number on the front of your Golden Tee Players Card, and you’ll be taken to the page where you’re currently ranked. If you are playing with a credit card or are unaware of your Persona ID you can find it on home page after logging into your web account. You’ll also be able to see your current ranking in the upper right corner of the payment screen once you check in. Get your games in, improve your position and stay tuned to Goldentee.com for much more on the GT World Rankings!